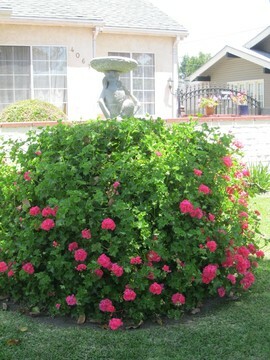 Being a Landscape Designer in Santa Clarita, California I walk around with both an eye for design and an eye for the absurd. I must say that driving around our community I think I find more old, tired, or completely bad landscapes than I do find beautiful gardens and I want to change that! It has been a long time since I wrote a post showing bad attempts at landscaping, so I thought I’d share a little bad taste and explain a few bad practices with the hope that I might prevent a few mistakes. Some of these photos don’t look bad on first glance, however I’ll tell you why they aren’t good so you know why sometimes things aren’t what they seem. 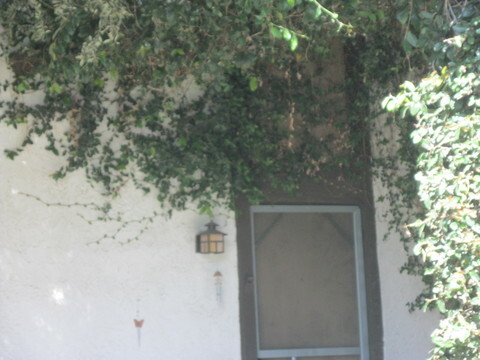 Ficus repens (Creeping Fig) is a great plant to quickly cover a block wall, but don’t let it grow on you home! It can pull off the paint or stucco, and forget about painting until it is removed (quite a chore) and G-d forbid you have to fumigate for termites. Look at the way this is fig is growing over the window and creeping up into the eaves. Not good! Let’s see how many big plants we can get into one (too skinny) 2′ wide planter bed. 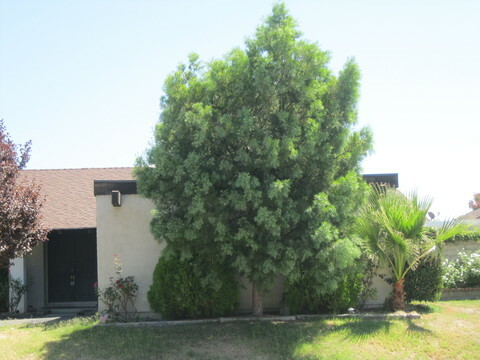 As if the Podocarpus wasn’t enough to take over, should we remove it, the Arborvitaes on either side or the fan palm on the right would be happy to damage the house, the planter and whatever else gets in their way. Those poor spindly roses on either side don’t stand a chance! 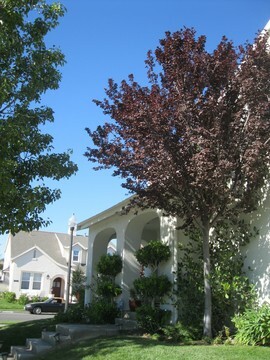 I love Purple Leaf Plums (Prunus cerasifera) but this poor buy has been planted way to close to the house. He will certainly be removed before his time and/or subjected to some unsavory pruning to keep him away from the house and hardscape. I wonder if this was a model, so they wanted it to “look good fast” so typical, however if they had just given him a few more feet away from the house he could have lived a long and happy life. This Cypress is not only too close to the house, but it is going to get way too tall for this space (note the awkward growth/pruning pattern already). If this is a Tiny Towers Cypress it is going to get 25′ tall and luckily it will stay about 3′ wide, if it is the standard Italian Cypress it wants to grow 80′ tall and 6′ wide – not good. A better selection for this spot would be a Green Mountain Boxwood which will slowly grow to about 5′ tall, or for a little more height Blue Arrow Juniper will top out at 12 – 15′ and be a slim 2-3′ wide. You do have options! This poor tree is being swallowed alive by this ivy. Yes it is a big tree, and the ivy did look so cute in the pot or flat what it was little and just planted but as I have ranted in my newsletter… If you aren’t going to look at and maintain a vine at least monthly, don’t plant one. 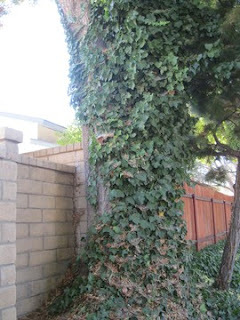 This is probably a 40 year old tree, I wonder how old that ivy is and when it was last pulled off the tree and or trimmed at all. This is just plain silly! This statue (or is it a fountain under there?) looks like it has a skirt on, maybe even with a crinoline under it. It is quite difficult to kill geraniums in Southern California, so pruning them at least once a decade is a great idea. Think of all the fabulous plant material we could plant around the base of this, that would accentuate the feature instead of hide it. Don’t plant an invasive species! This Equisetum (Horsetail) in the middle of this bed is one of those plants that you can just never get rid of, and neither can your neighbor. This plant will place you high on the list of least favorite gardener of the block. Other invasives include mint, Mexican Evening Primrose and Scotch Broom. If you love these plants and just can’t live without them, I’d think about planting them in pots instead of the ground. 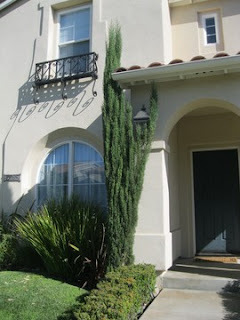 That Horsetail should have the pot placed on cement, just in case and I’d steer completely away from the Broom. 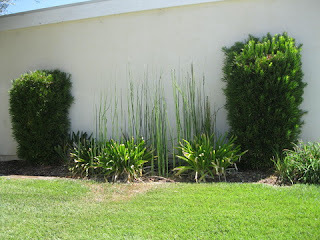 A good substitute for the horsetail would be Chontropetalum (Cape Rush) or even one of the Juncus varieties. Some of these picutures overlap into more than one category but the funny part is, all of this could be avoided if the gardener (and I use that term loosely) had either read the label of the plant they purchased and measured or if the homeowner had hired a real professional. They say you should measure twice and cut once but I say measure twice, read twice, and plant once. Problems solved! If you live in or near Santa Clarita, please join me on Saturday September 22, 2012 at Green Thumb Nursery at 23734 Newhall Avenue Newhall, CA. 91321. It is an all day event with raffles, prizes, snacks and contests. I’ll be speaking at 10 am and I’ll stay till noon to answer questions or walk around the nursery with you. I hope to see you then!